Stephen Hawking Biography Activity Sheet – Download the best fun science kids activity sheet printables about Stephen Hawking. Who was Stephen Hawking? Use this fun kids activity sheet to get you kids to read and find out fun facts all about Stephen Hawking. 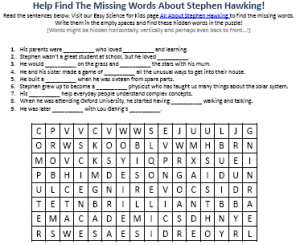 The Stephen Hawking Biography activity sheet includes a fun hidden words puzzle and a find the missing words puzzle game for kids. This fun science activity sheet is free to download and free to print and use. Educators can use this free fun science activity sheet to supplement science lessons at school, after school science classes and extra curriculum science enrichment programs. Parents can use this fun Biography of Stephen Hawking activity sheet to educate and inspire their kids about this great physicist. Kids enjoying homeschooling can also enjoy the hidden missing words game. The Stephen Hawking Biography activity sheet is ideal for Preschool kids, Kindergarten kids and Grade school kids from Grade 1 to Grade 5. Grammar school kids can use this fun science activity sheet as a reading comprehension tool to test and improve their reading skills. Preschoolers and Kindergarten kids who can’t yet read can use this best Stephen Hawking science kids activity sheet as a listening comprehension game. EasyScienceforKids.com is a great teacher and parents resource for fun facts about science. We provide free fun science activity sheet printables and free word search puzzles for kids. Stephen Hawking was a great physicist who studied the solar system. He wrote books and believe that time travel is possible. Learn about Stephen Hawking discoveries and theories by downloading this free activity sheet for kids! [sociallocker]Download best fun science kids activity sheet about Stephen Hawking. Download FREE Stephen Hawking Biography Activity Sheet for Kids! Like the FREE Stephen Hawking Biography Activity Sheet? Find out more about Stephen Hawking here.